In recent years Scottish chefs like Nick Nairn and Tom Kitchen have been leading an evolution in Scottish dishes. But there are some recipes that are steeped in tradition. Haggis, neeps and tatties is one of these. “Haggis, neeps and tatties, the Holy Trinity. It never goes wrong.” laughs award-winning haggis producer, James Macsween. So here, for you, is a simple guide to preparing Scotland’s national dish. 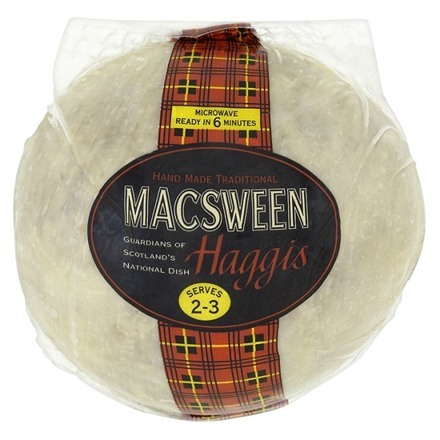 We’ve based our measurements on a family of four but Macsween produce ceremonial haggis that can feed up to 16 as well as catering packs. Poach the haggis in smoking water for an hour and a half. Open and serve with equal amounts of neeps and tatties and a wee dram. Alternatively, follow the instructions on the packet and microwave. Preheat oven to 180C/350F/gas mark 4. Prick the potatoes, place the sea salt on a baking tray and put the potatoes on top. Bake for an hour and a half or until soft. Once cooked, cut in half and scoop out the potato (this method will keep the mash dry) then slowly add the butter, milk and season, then set aside. Peel and dice the turnip, then cook in a pan of salted water until tender. Drain and mash with butter, salt and nutmeg and set aside. To serve, place equal portions of haggis, neep and tatties and serve with whisky gravy. Looking for a haggis gift pack? 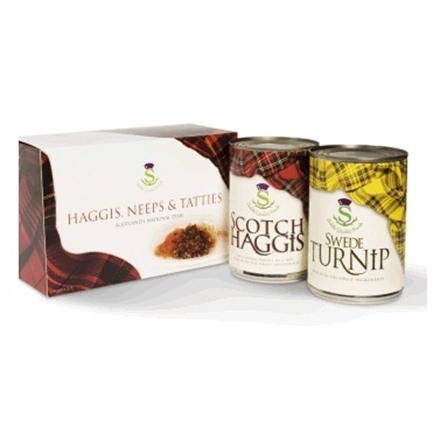 We have the perfect gift pack containing Stahly’s Scotch Haggis, tinned turnip and instant potato. 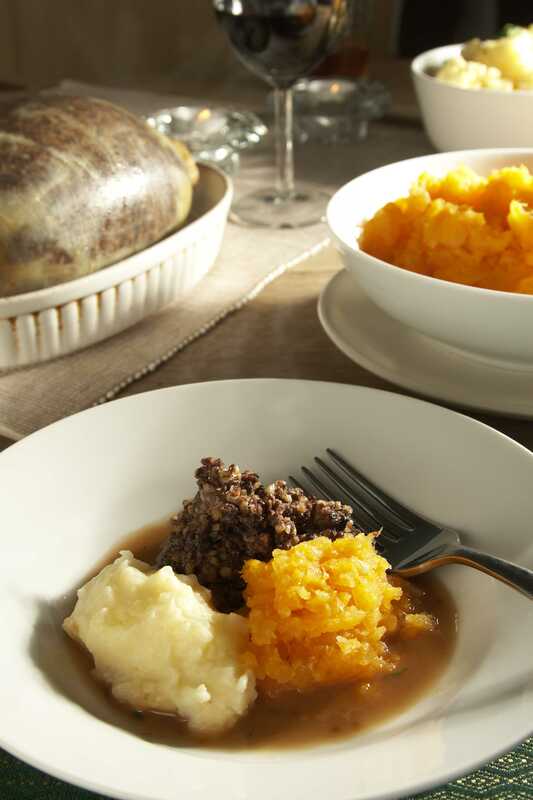 A complete Burns’ Supper, and very simple to prepare. Please note meat products will be substituted for deliveries to USA, Singapore & Australia. 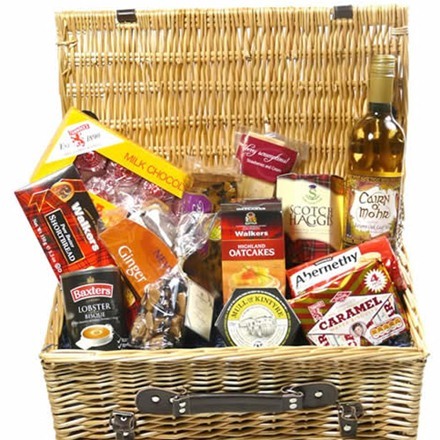 Why not go for a Taste of Scotland hamper? Looking for the complete Scottish food experience? Our Taste of Scotland hamper includes the very best of Scottish food including some of the best known brands like Tunnocks, Baxters and Walker. This is the perfect gift for your favourite Scot abroad. Buy the Taste of Scotland gift hamper here.